The 1979 Harley Davidson Electra Glide Shovelhead for sale is tricked out with ALL the chrome and a classic black paint color. This Shovelhead is a beautiful motorcycle that has a 4 speed transmission and LOW mileage! It looks, runs, handles and rides like a dream and is an eye-catcher to boot! When I say LOW mileage I mean it! Only 12,469 miles ridden in over 30 years! If you would like to write a review or voice any opinions on the 79 Electra Glide Shovelhead, you may use the comments form below this ad to do so. Thanks for visiting GoGoCycles Used Motorcycles for Sale and for taking a look at my 1979 Harley Davidson Electra Glide Shovelhead. My location is West Harrison IN Indiana and in my opinion when you find a vintage motorcycle like this with a price of only $9749 on it...that's cheap enough that it won't be beat on Craigslist or in an Ebay auction and it's time to RIDE! If you want to take a look or have questions, call me (NO EMAILS) 5one3-two76-5323 for more details and don't forget to mention that you found this ad on Strike Lightning's Used Motorcycles and Parts for Sale www.gogocycles.com. Join in and write your own page! It's easy to do. How? 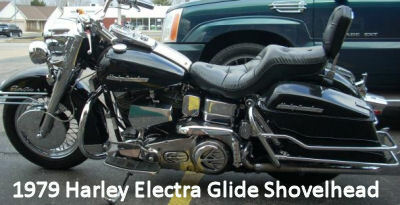 Simply click here to return to HARLEY ELECTRA GLIDES - 1979.